Lake Country CCS Foam Pad Technology revolutionizes foam buffing pads! Lake Country Manufacturing unveiled CCS Foam Pad technology at SEMA in November 2006 and the industry has been talking about them ever since. This new foam pad design eliminates some of the common problems of conventional foam pads to provide you with a safer, more user-friendly buffing pad. 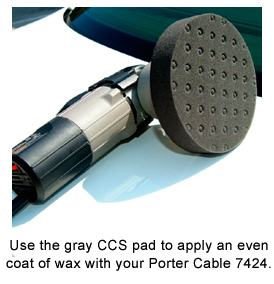 CCS foam pads work on every type of paint, from conventional clear coats to the harder, scratch-resistant clear coats used by Mercedes Benz and the Ford Motor Company. Lake Country's range of foam compositions, combined with the right chemicals, provides you with a prescription to correct almost any paint imperfection on any paint finish. You might remember that Autogeek used to carry pads with a splatter pocket, which was a concavity in the middle of our 7.5 and 8.5 inch pads. Ultimately, I decided that the splatter pocket reduced the amount of surface contact and it probably wasn't worth it considering you can avoid splatter by gradually increasing speed. CCS pads revive the idea behind the splatter pocket but the design is much better. The CCS pockets hold any extra product and gradually release it as needed. 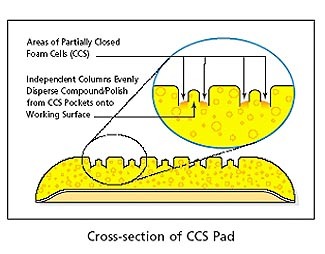 The CCS pockets function like many splatter pockets by reducing splatter and regulating the release of extra product, but you don't lose any contact surface. CCS pads are available in 6.5 inch and 7.5 inch. For a 6.5 inch pad, we recommend a 5 inch backing plate. For a 7.5 inch pad, we recommend a 6 inch backing plate. CCS pads are available in the same 5 varieties as our Wolfgang EuroTech Smart Foam Pads, also manufactured by Lake Country. Yellow Cutting Foam Pad- Use this pad to apply compounds or polishes to remove severe oxidation, swirls, and scratches. It is the most aggressive and should only be used on oxidized and older finishes. Always follow this pad with an orange pad and a fine polish and then a white pad to refine the paint until it is smooth. 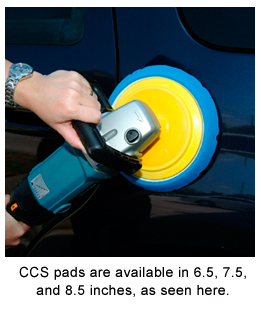 Orange Light Cutting CCS Foam Pad- Firm, high density foam for scratch and defect removal. Use this pad with polishes and swirl removers. It’s an all around pad that will work on most light to moderate imperfections. White Polishing CCS Foam Pad- Less dense foam formula for the application of waxes, micro-fine polishes and sealants. This pad has very light cutting power so its perfect for pre-wax cleaners. Green Polishing/Finishing CCS Foam Pad- Use this foam to apply one-step cleaner waxes. It is a balance of polishing and finishing that is perfect for all-in-one product application. Gray Finishing CCS Foam Pad - Composition is firm enough to withstand added pressure during final finishing to remove buffer swirls. It has no cut and will apply thin, even coats of waxes, sealants, and glazes. 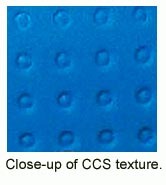 Blue Finessing CCS Foam Pad – Flat pad has soft composition for applying glaze, finishing polish, sealants, and liquid waxes. Flat pad provides full contact with paint surface to minimize the pressure applied by the user. To clean all foam pads: Mix a scoop of DP Polishing Pad Rejuvenator in 3-4 gallons of water before you begin detailing. When you're finished with each pad, toss it in the mixture to soak. Mild agitation with a Foam Conditioning Brush will release any polish residue. Rinse the pads and lay them flat to dry. Lay the pads foam side down. If foam pads are left to dry with the hook & loop facing down, water will settle where the hook & loop is glued to the foam and it may affect the glue. For the best results, lay pads foam side down so water drains down and out of the foam. An extensive selection of quality brands and products makes for one stop shopping. Items are almost always in stock. Forum discounts on top of sale prices make for low prices. Customer service went above and beyond the call of duty for me. I'm very happy with Autogeek and Ill be shopping here again soon.